Dallas Stars Owner Thomas O. Hicks announced today that he has restructured the NHL club’s hockey management staff, naming Joe Nieuwendyk as the team’s new General Manager. As part of the reorganization, Co-General Managers Brett Hull and Les Jackson have been reassigned within the organization into positions that focus on their respective strengths. Hull will serve as Executive Vice President and Alternate Governor while Les Jackson will return to his long-time role as Director of Scouting and Player Development. “We are very excited to secure Joe Nieuwendyk as the General Manager,” said Hicks. “These moves are all about helping this club take the proverbial ‘next step.’ Joe is a leader and has been a winner in everything he has done. He is ready for this opportunity and has a bright future as an NHL General Manager. We want that future to be with the Dallas Stars. The Stars are going back to a single-leader mentality at the top of their hockey staff. Much like when Bob Gainey was the General Manager, Nieuwendyk brings years of playing experience, a winning pedigree, intelligence (he went to Cornell for three years), respect for the game, and leadership. Basically, he is the total package. Nieuwendyk, 42, is considered by many to be one of the top up-and-coming hockey executives in the league today. The former Stars player returns to Dallas from the Toronto Maple Leafs, where he served as Special Assistant to the General Manager this past season. Prior to joining the Leafs and after his 2006 retirement, Nieuwendyk worked as a Special Consultant to the General Manager with the Florida Panthers. As Assistant General Manager, he also helped lead Team Canada at the 2009 IIHF World Hockey Championship when the team won a silver medal. A veteran of 20 seasons as a player in the National Hockey League, Nieuwendyk played seven with the Dallas Stars (1995-2002). He won the Stanley Cup for three different teams, in three different decades (Calgary in 1989, Dallas in 1999, New Jersey in 2003). 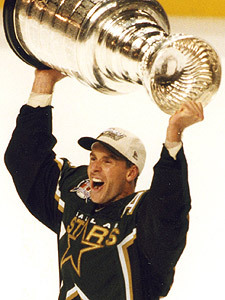 Nieuwendyk was awarded the Conn Smythe Trophy as the Stanley Cup Playoffs most valuable player in 1999 when he led Dallas in post-season scoring on their way to winning the Stanley Cup. The Whitby, Ontario, native played in 1,257 NHL games, scoring 564 goals and 562 assists for 1,126 points. He also appeared in 158 career playoff games, recording 116 points on 66 goals and 50 assists. Nieuwendyk played in 442 games for Dallas, scoring 178 goals and 162 assists for 340 points. Hull and Jackson were named as the Stars’ Interim Co-General Managers on Nov. 13, 2007. The interim tag was removed last May. The Stars amassed a record of 74-58-15 regular season record under Hull and Jackson, with a trip to the 2008 Western Conference Finals. Hull, 44, played 19 years in the NHL and is a two-time winner of the Stanley Cup (Dallas in 1999, Detroit in 2002). He joined the Stars’ front office in 2005 as a Special Assistant upon his retirement as a player. Jackson, 55, has worked in the Stars organization for 22 years, dating back to the team’s days in Minnesota, spending much of it managing and overseeing scouting and monitoring the development of all amateur and professional prospects. Nieuwendyk will be formally introduced to the Dallas media at a press conference on Monday.